Veal saltimbocca is an Italian dish consisting of thinly-pounded veal scallopine sandwiched with sage leaves and proscuitto, sauteed in a pan with a white wine sauce. Classic veal saltimbocca can be a bit of a challenge to prepare at home, as it involves whole pieces of veal layered with the other ingredients and cooked very gently so it doesn’t fall apart in the pan. We came across a much simpler version and liked it so much that we may never do it the old-fashioned way again! As with most of our quick-cooking dishes, we like to prepare all of the ingredients in advance before we start the actual cooking. First, chop up about two cups of mushrooms. Also chop some fresh sage leaves and fresh parsley. As we’ve said before, chop the vegetables before you cut the raw meat, so you can do it all on a single cutting board, without contamination. Proscuitto is usually sold in thin slices, separated by thin strips of paper. Because we’re going to chop up the proscuitto, there’s no need to separate the meat into perfect slices, making this dish all the more easy to prepare. Just remove all the proscuitto from the paper and pile it on the cutting board to chop. Chop the prosuitto into small pieces. Cut the veal scallopine into bite-sized pieces, approximately an inch in width. On your cutting board, dust the delicious veal pieces in some flour, then shake off most of the flour. Add the lightly floured veal to the hot pan and saute until the veal starts to brown. Using tongs, turn the veal so that it cooks evenly. You can tell that the veal is finished when it begins to develop that beautiful brown exterior. 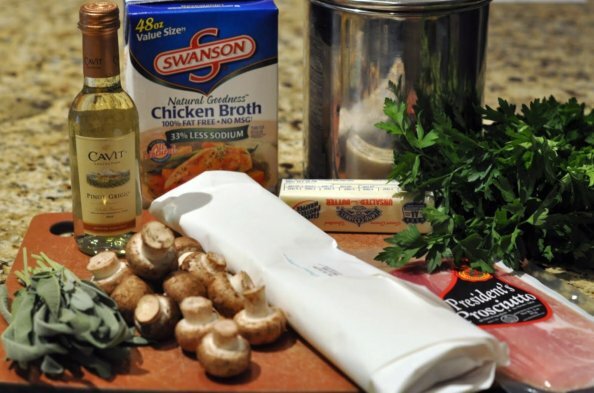 When the veal is browned, remove it to a small plate and tent with aluminum foil to keep it warm, then add the mushrooms to the pan. Continue to cook the mushrooms until they begin to brown. Add about a half cup of white wine to the pan to deglaze. While the wine reduces for a few minutes, use your tongs to scrape up the browned bits in the pan. Most of the flavor for the sauce comes from this step. Add the chicken stock and a tablespoon of the chopped sage leaves, then give it all a good stir with your tongs. Then add the cooked veal pieces, as well as any accumulated juices from the plate of veal. Add the juice of half of a lemon. If you squeeze the lemon from one hand into the other, you collect the lemon seeds in your hand and keep them out of your dish. Stir it all together and cook for a few minutes until the veal is hot again. Taste the sauce and add salt and pepper as needed. Finally, just before serving, sprinkle the remaining sage leaves and the chopped parsley over the top. This recipe is a great way to turn a restaurant favorite into an easy weeknight meal. The flavors are all there, but chopping up the veal, proscuitto and sage ahead of time instead of layering them saves time (and frustration). Heat a pan over medium high heat, and add a half tablespoon each of butter and olive oil. Season the flour with salt and pepper, and dredge the veal in the flour, shaking off any excess. Cook the veal for a few minutes until it begins to brown slightly, and remove it from the pan and set aside. Add the mushrooms to the pan and sauté until they begin to brown. Add the wine, stir to deglaze the pan, and cook 2 minutes. Add the chicken broth, veal, prosciutto, juice of half the lemon and chopped sage leaves. Stir and cook 5-10 minutes until the sauce has thickened. Add the remaining sage and parsley to the top, sprinkle with the juice from the other half of the lemon and serve. This was wonderful and easy to fix. I will have to do this one again. Thank you for your pictures. They really help, in many ways. Good work. Thanks Karen! We’re so glad to hear that you enjoyed it, and that it was easy! I tried the veal tonight and see it’s potential despite my mistakes. As I frequently do, I overcooked the veal. I also thought I would try to make it more “earthy” by buying shitake mushrooms. I wanted Chanterrelles, but they were out at CM. I also used my own stock which I made from a Greenberg Smoked Turkey carcass. These were three big mistakes. The dish was still above par and when I make it next time, hopefully I will avoid my errors. Because I overcooked the veal, it was a bit tough. The mushrooms wound up having an “off putting” texture and the stock was kind of overwhelming. It was definitely easy to prepare and the portions were perfect for two. Mark – thanks for sharing your experience w/ the veal. I’ll find out if Dan has any tips about cooking time. How good is the Greenberg Smoked Turkey?!? We received one as a gift a couple of years ago and used the carcass to make amazing lentil soup. I love the Greenberg Turkey. It has a wonderful flavor(usually lacking in turkey) and the stock is also delicious, but should not be used in delicate sauces because the flavor can be overwhelming. I like to use it in Dean Fearing’s Cheddar cheese soup recipe in which I substitute green chilis for the poblanos. It is really decadent, but I have to have it every once in a while. Cheddar Cheese Soup — yes, please! I like to use hatch green chilis instead of poblanos. I also prefer and extra sharp cheddar (I use Tillamook). This is a very easy recipe, especially if you have a hand held blender. And a great stock makes all the difference. Hi Mark, Dan here. This soup sounded so amazing that we had to make it for lunch today, and you are correct — it is super easy and absolutely delicious. We used Hatch green chiles, as well as some roasted poblanos and a jalapeno from our own garden. Thanks for the great new recipe! I have been looking for a good veal saltimboca recipe to try, and I really like a lot about this one and think that I will give it a try. I have one question though- I have had saltimboca quite a few times, and if I remember correctly the dishes that I had also had some sort of mild cheese in the dish. Am I completely wrong, or do some people use provolone, fontina, etc. in their veal saltimboca recipes? Hi Aimee. Thanks for your comment! Most of the classic veal saltimbocca recipes we have found do not include cheese, but we are firm believers that a little bit of cheese makes almost anything better. A little grated parmesan or fontina on top of this veal would probably be really good. Just not too much, since the dish is already pretty rich on its own. – I’d quickly sauté & remove the prosciutto before doing the veal, just to get a little cooking of it, then add back at the end. – olive oil doesn’t really keep butter from burning, but it does add a little margin of safety. – I’ve completely switched to using limes instead of lemons, purely to avoid having to fool with the seeds. My wife & I did a blind taste test and couldn’t tell any difference between lime & lemon juice. Thanks for this! Will try soon.